The year is 2016 and we modern humans not only expect everything to be found at our fingertips, we demand it. In fact, if it isn’t available as an app or delivered to our at-that-very-second GPS location, or integrated into every other social media section of our lives, then we don’t stamp our foot and whine, we simply blink and move on to the product or service that does. Today, we stream our visual entertainment on mobile devices, use Uber, which is now a verb, not just a company (what’s a taxi? ), and have anything and everything plopped in front of us by way of millions of apps. We want for nothing. We are very, very, very spoiled. Hell, if I want people to pick up my dry-cleaning, walk my dog, scour my sink, wash my hair, fix my iPhone, and hand the hottest Starbucks to me at exactly 8:06am, I can. With these on demand make-your-life-easier-and-more-cost-effective solutions also comes on demand at home and on locations massages, because let’s face it. Having everyone else do everything for you personally just opens the door to having more time to work and get fit, so now you NEED a massage (more stress and strain on your mind and muscles!). And why not have it delivered to your home so you can just roll off the massage bed and into your own sleeping comforts? True, there is something magical about that luxury-except it’s not considered a luxury across the U.S. anymore. It’s all over and Zeel Massage is just the latest of these companies to enter the D.C. market by storm (and even during the storm.). 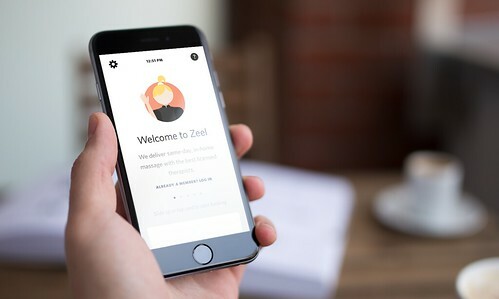 Found in over 12 major metro areas and their surrounding cities, Zeel boastsÂ nearly 5,000 Massage Therapists nationwide, and is considered the first, largest, and fastest-growing on-demand massage company in the United States. Her expert hands and technique kneaded out the stresses of my laptop/iPhone positioning in my shoulders and she worked over my legs, which had been spinning round and round in SoulCycle and shaking in Pure Barre. It was over, she cleaned up and was out. Quick and easy. And I never had to leave my apartment! Zeel Massages are available in as little as an hour â€“ or up to 30 days in advance – from booking, to homes, hotels, workplaces, and events. Zeel Massage Therapists bring the massage table and spa music – everything needed to turn a living room or bedroom into a spa. â€“ including holidays. Zeel Massages can be booked through the Zeel app for iPhone and Android and on zeel.com, for start times as early as 8:00 am and as late as 10:30 pm. Zeel Massage options include Swedish, deep tissue, prenatal, sports, and couples massage; 60- minute, 75-minute, and 90-minute massages are all available. Book with confidence; Zeel Massage Therapists are fully vetted, experienced at the finest establishments, background-checked, and licensed in their state of practice. For committed massage lovers whoâ€™d rather subscribe to massage than a cheese-of-the-month- club, Zeel also offers the first and only in-home premium massage membership, Massage Zeelot, which includes a Zeel Massage a month for a year, a free professional-grade massage table, and many other benefits. But Zeel isnâ€™t table-only. Zeel Chair Massage, perfect for workplaces, conventions, and events, is available nationwide.